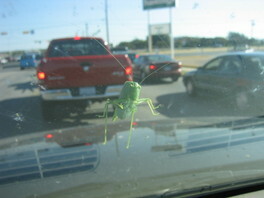 While driving to ballet this morning, I noticed this bug on the hood of the car. It clung to the hood for miles. I was driving at a little over 70 mph (okay, so I speed a little) and it clung to the hood the whole time. It was amazing. Then after about an hour we were off the highway and drove slower with stops at stoplights. 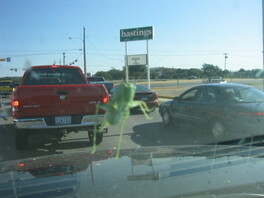 That's when it started to climb up the windshield. Look how much it looks like a leaf. 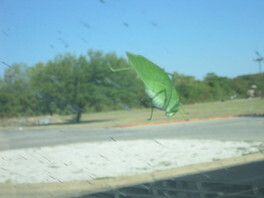 I wanted to get a closer picture once we arrived at ballet, but it flew away while I was parking the car. Editing to add: My windshield is really dirty. My car sure needs a bath. Dawn at By Sun and Candlelight has another Field Day up. Check out the many places where nature study abounds. You can find much inspiration--just what I need. Sometimes you have to go with the flow. Today's plans were to prepare for our visits from family in the next three days. Papa's aunt is coming to visit tomorrow and my cousin from Korea is coming. My cousin, who is also Honey's godmother, has been in the country since Saturday taking a whirlwind tour of Washington DC and New York. I ditched the school plans in favor of cleaning, haircuts and some nature study. We got out (more on that later) and spent about 2 hours playing in the dirt and having a ball. After baths (they were that filthy), I had planned on reading to them from some books I've had waiting for the month of September. I had a list of about 10 and I've only read 2. Well, after coming out of the bathroom with Brother, my sister had turned the TV on for her son. I can read to them tonight before bed. Sometimes you just have to go with the flow. Lately, I've not been inspired to blog. I've read many and everyone always has so much to say. I have to admit I've always been a bit taciturn, but I feel like I've crawled deeper into myself. It seems I don't have a lot to say but...I know I do because my mind is always in overdrive. Maybe I just need to organize my mind as well as my surroundings. Maybe I just need to get into my own home with my own rules and schedules. One team is big name. One is not. The players on one team have their names on the jerseys while the other does not. One team has players who will most definitely deploy to war zones within a year or two. The may have some who will. The West Point Cadets are playing the Texas A&M Aggies right now. Of course, the Cadets are the underdogs, but their fighting hard. They are not expected to win, but you can't help but cheer them on. I'm even praying for them. I feel a bit guilty because there are more important things to pray about, but I really want the Army team to win. UPDATE: Texas A&M 28, Army 24. It was a great game. The Cadets played a wonderful game where they showed determination and grit. It was 3rd and goal with 9 seconds to play. They didn't make it. Anyone who watched the game should be proud to know what kind of men will be the future leaders of their military. I'm just awed by their performance. This also shows me, that well, we're ready for the next important ones: Air Force and Navy. Today we are having another Loveliness Fair. Kim is our hostess. Today's theme is Loveliness in the Bedroom. There are some wonderful posts. Take a look. I decided to take the plunge and participate in this Loveliness Fair. Our house is under construction. In the meantime, we are living with my parents. We are currently, minus our soldier Daddy, a family of 5 living with my parents. It can be cramped at times especially now with my brother living here temporarily while he finds a job. 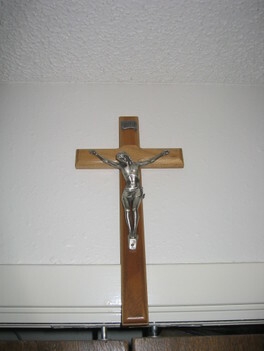 When we visit we always use the room we lived in years ago when it was just Brother and me while my husband was in Korea. 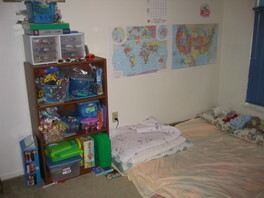 In my autistic son's mind, this is his home and this room is his as is the bed that is in there. 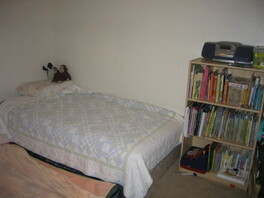 You can see the bookshelf that is at the foot of his bed. There sits a radio where we listen to music and audio books (I was going to say books on tape except they're all on CDs). This is just a fraction of the books we own. Most of them are in storage much to my children's dismay. They miss their books more than their toys. This is the shelf that holds our Leap Pads, LEGOS, and Barbies along with any small miscellaneous toys that fit into the small blue boxes. Elegant? No. Simple? Yes. We don't have much elegance in this room. Just simplicity. 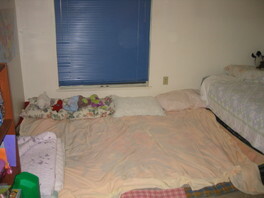 This is where the girls and I sleep. It's very comfortable and I like knowing the girls are right there with me. They sleep better too knowing subconsciously that I'm there. It's really good all around. We do all fit. We could have half this size and we'd fit because for some reason, by the morning, they're all right there clinging to me. Even my son has been known to be found right next to me snuggling up against me. What could be lovelier? No words needed for this picture. Well, I hope y'all have enjoyed this peek into our home. So, yesterday, Brother was upset about something and he was crying. He stopped and says to me, "Mommy, I tasted a tear." Me: "You did?" Brother: "It tastes like pee."